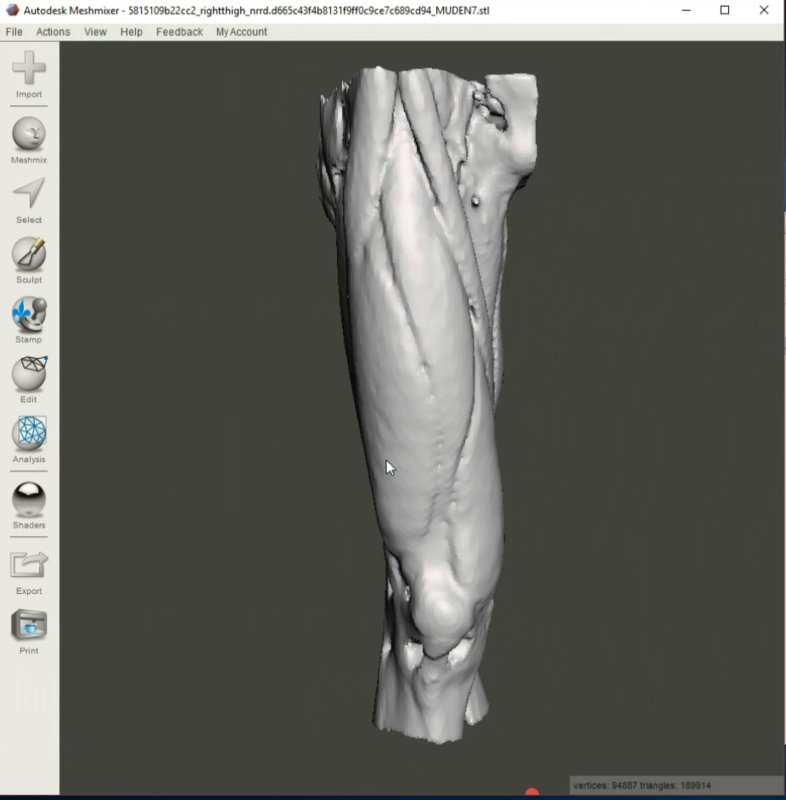 In this tutorial we will learn how to use the free medical imaging conversion service on embodi3D.com to create detailed anatomic muscle and skin 3D printable models in STL file format from medical CT scans. Muscle models show the detailed musculature by subtracting away the skin and fat. Even when created from a scan of an obese person, the model looks like it comes from a bodybuilder, Figure 1A. Skin models show an exact replica of the skin surface. The finest details are captured, including wrinkles and veins underneath the skin. Hair however is not captured in a CT scan and thus the model does not have any hair, Figure 1B. These models can be used for a variety of purposes such as medical and scientific education and research. 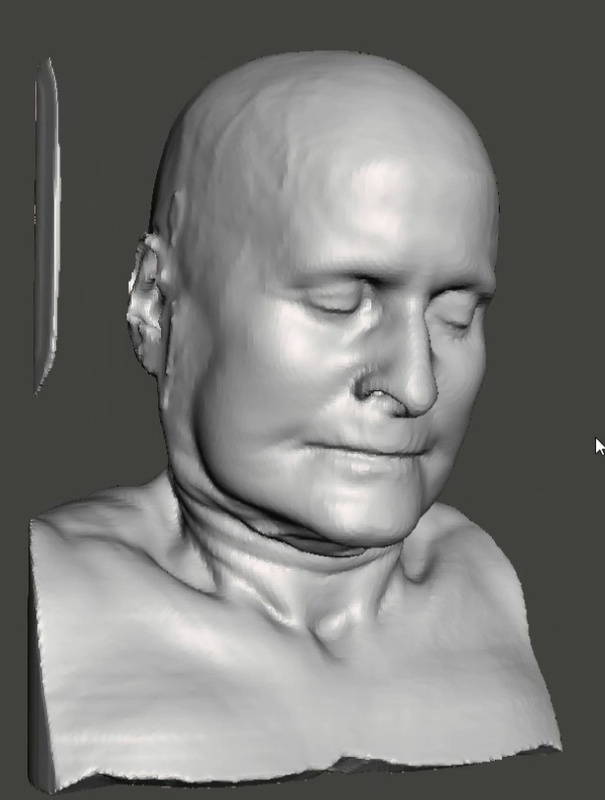 Additionally, the skin models can be used to re-create a person's likeness in 3D from a medical scan. If you have had a CT scan of the head, you can create a lifelike replica of your head. You can create replicas of your friends, family, or even pets if they have had a medical CT scan. Alternatively, if you have a loved one who passed away but had a CT scan prior to death, you can use the scan to re-create an exact replica of their face. Even scans that are years old can be used for this purpose. Some people may consider this to be a little creepy, so if you are considering doing this think carefully first. Before proceeding please register for an embodi3D.com account if you haven't already. You will need an account to use the service. It is highly recommended that you download the associated file pack for this tutorial so that you can follow along with the exact same files that are used in this tutorial. If you are interested in learning how to use the free embodi3D.com service, see my prior tutorials on creating bone models, processing multiple models simultaneously, and sharing and selling your models on the embodi3D.com website. 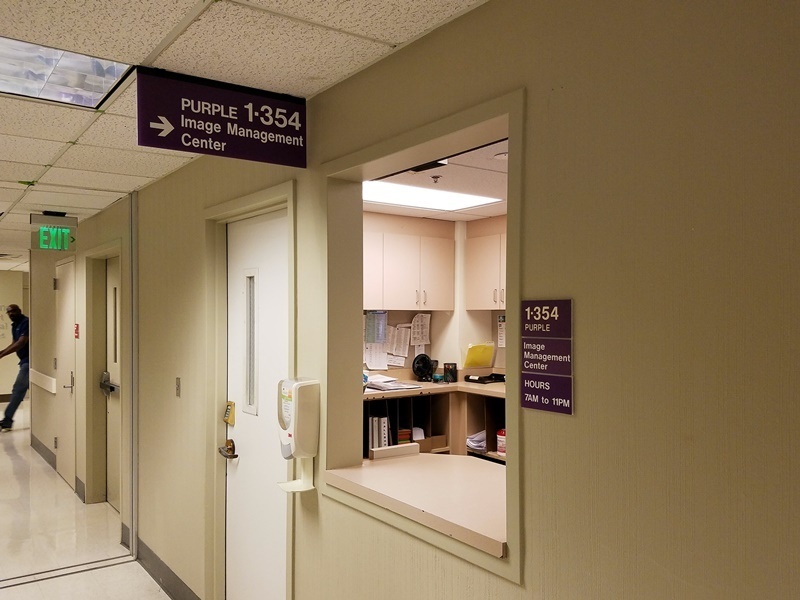 Figure 2A, the Image Management (radiology) department at my hospital, where you can pick up a DVD of your CT scan as shown in Figure 2B (right). My hospital does this for free, but some may charge a trivial fee. Before we begin please bear in mind that this process only works for CT scan images. It will not work for MRI images. Before proceeding please check that the scan you wish to convert is a CT (CAT) scan! Open 3D Slicer. If you don't have the software program you can download it for free from slicer.org. 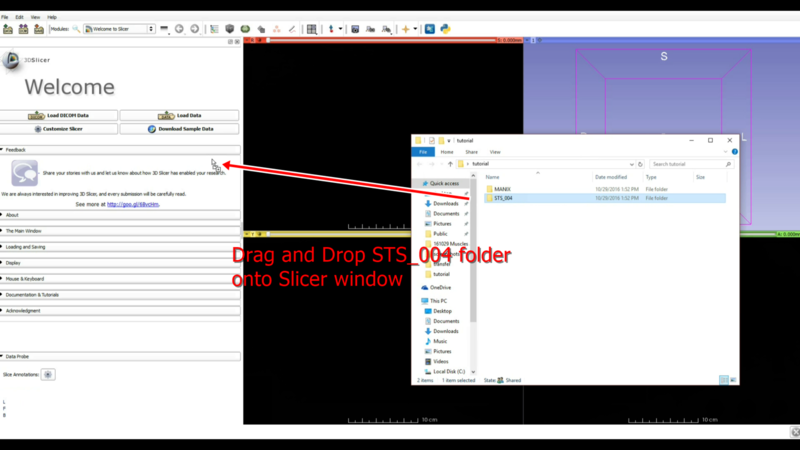 Once Slicer has opened, take the folder from the download pack that is called STS_004. 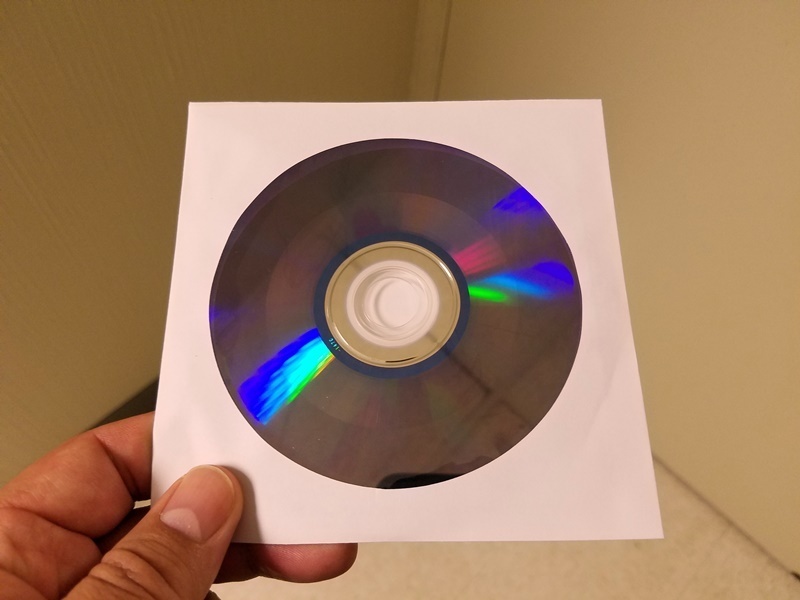 This folder contains anonymized DICOM images from a CT scan of the legs of a 24-year-old woman who had a muscle tumor. Drag and drop the entire folder onto the Slicer window, as shown in Figure 3. Slicer will ask you if you want to load the images into the DICOM database. Click OK. Slicer will also ask you if it should copy the images into the database, click Copy. Slicer will take about one minute to load the scanned. Next, load the scan into the active wor king area in slicer. 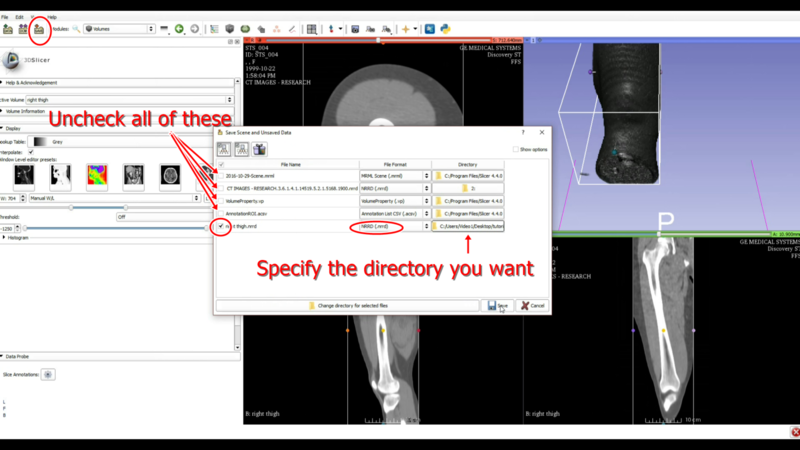 If the DICOM browser is not open, click on the Show DICOM browser button, as shown in Figure 4. 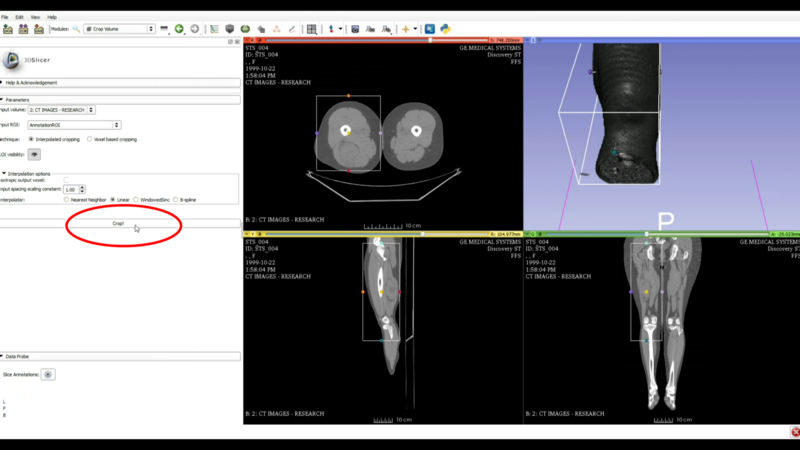 Click on the STS_004 patient and series, and click the Load button, as shown in Figure 4. 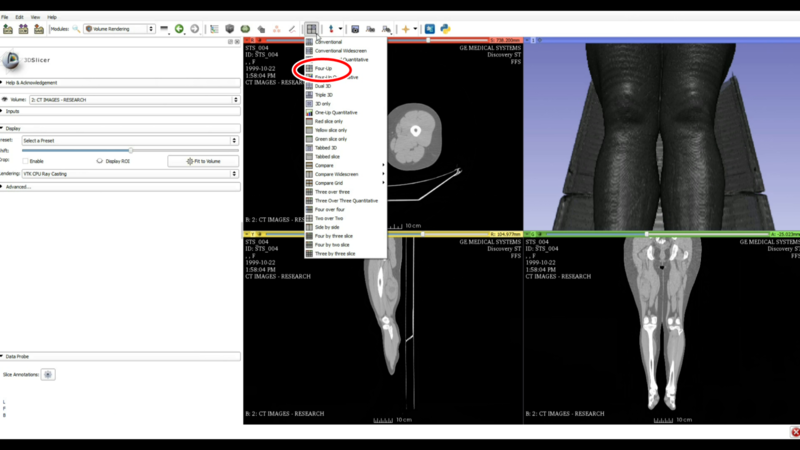 The leg CT scan will now load into the active seen within Slicer, as shown in Figure 5. Step 2: Trim the Scan so that only the Right Thigh is included. Click on the Volume Rendering module from the Modules drop-down menu as shown in Figure 6. 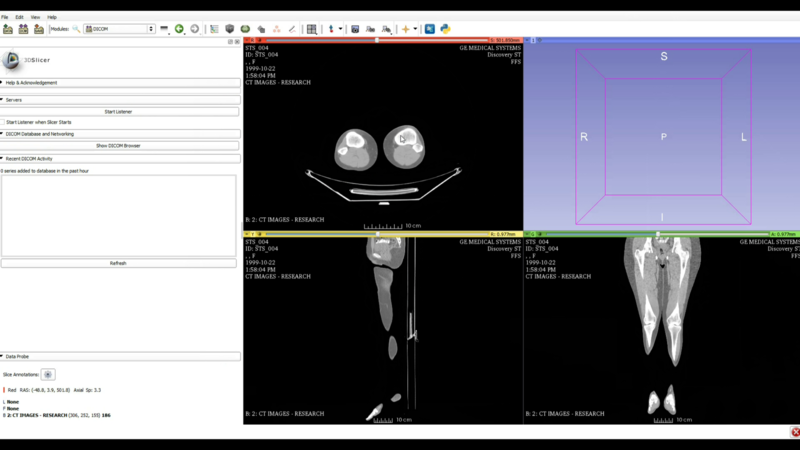 Turn on volume rendering by clicking on the eyeball button, as shown in Figure 7. 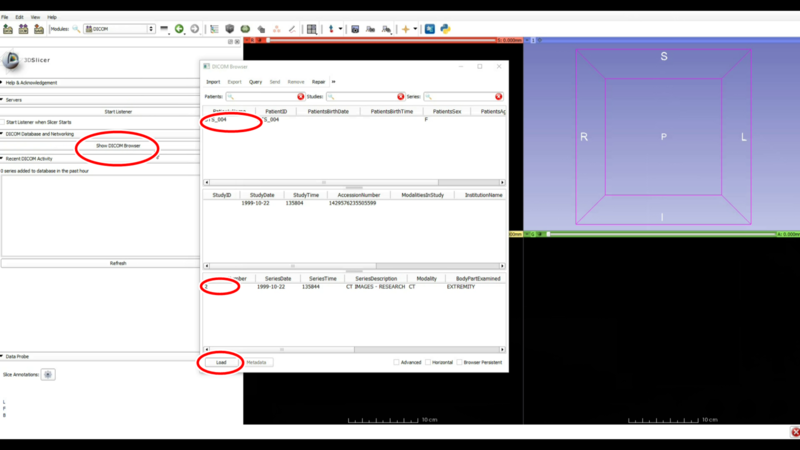 Then, center the model in the 3D pane by clicking on the crosshairs button, Figure 7. If you don't have the same window layout as shown in Figure 7, you can correct this by clicking on the Four-Up window layout from the window layout drop-down menu, as shown in Figure 8. Figure 7: Center the rendered volume. Next we are going to crop the volume so that we exclude everything other than the right knee and thigh. From the modules menu, select All Modules, Crop Volume, as shown in Figure 9. Turn on ROI visibility by clicking on the eyeball button, as shown in Figure 10. 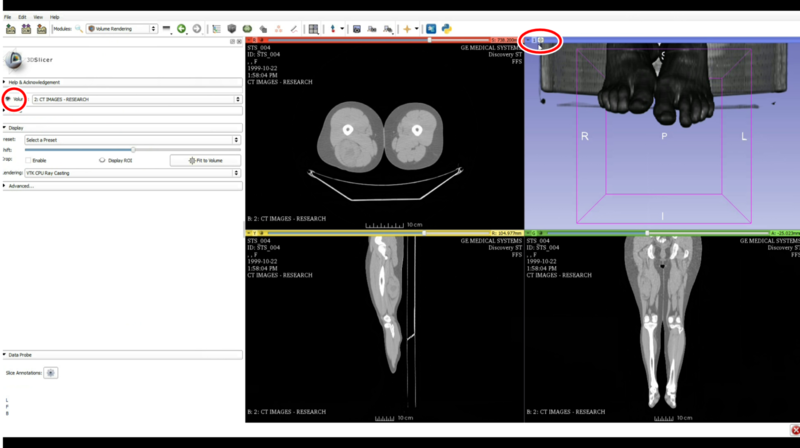 Then, move the region of interest box so that it only encapsulates the right thigh, as shown in Figure 10. You can adjust the size of the box by grabbing on the colored circular handles and moving the sides of the box as needed. Figure 9: The Crop Volume module. Once the crop volume ROI is adjusted to the area that you want, perform the crop by clicking on the Crop button, Figure 11. Figure 11: the Crop button. The new, smaller volume that encompasses the right fight and knee has been assigned a cryptic name. 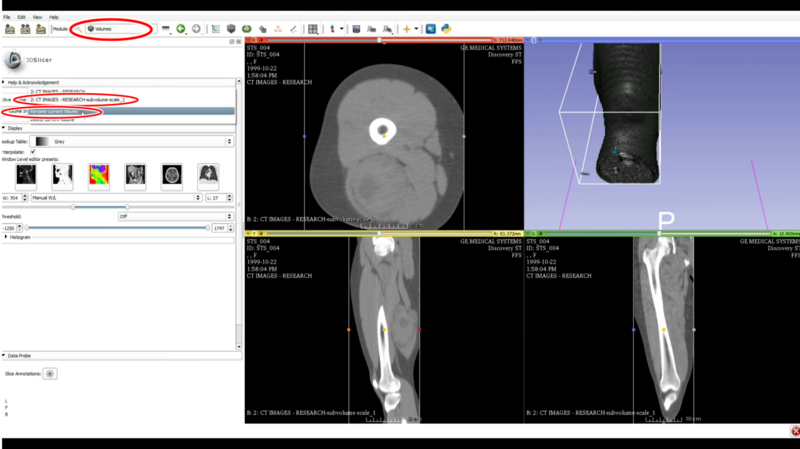 The entire scan had a name of "2: CT IMAGES – RESEARCH," and the new thigh volume has a name "2: CT IMAGES-RESEARCH-subvolume-scale_1." That's a mouthful and I want to rename it to something more descriptive. I'm going to select the Volumes module, and then select the "2: CT IMAGES-RESEARCH-subvolume-scale_1" from the Active Volume drop-down menu. Then, from the same drop-down menu I'm going to select "Rename Current Volume". Type in whatever name you want. In this case I'm choosing "right thigh." Figure 12: Renaming the newly cropped volume. 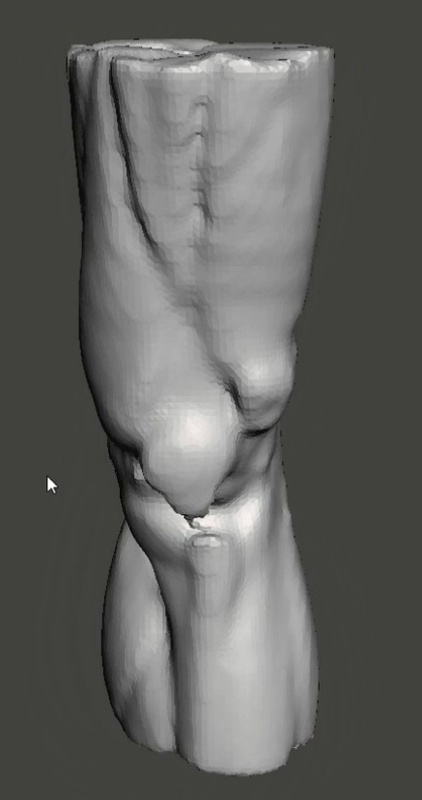 Step 3: Save the right thigh volume as an anonymized NRRD file. Click on the Save button in the upper left-hand corner. The save window is then shown. All the checkboxes on the left except for the one that corresponds to the right by. Make sure the file format for this line says NRRD (.nrrd). Make sure you specify the proper directory you want the file to be saved as. When you are satisfied click on save. This is demonstrated in Figure 13. In the specified directory you should see a called right thigh.nrrd. Figure 13: The save file options. 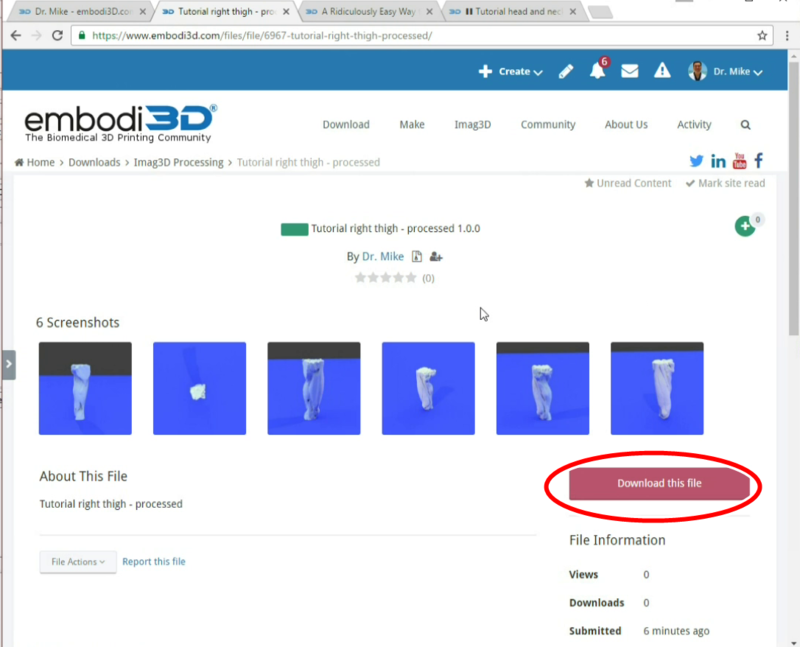 Make sure you are logged into your embodi3D.com account. Click on Imag3D from the nav bar, Launch App. Then drag-and-drop your NRRD file onto the upload pain, as shown in Figure 14. Figure 14: Uploading the NRRD file to embodi3D.com. Figure 15: File processing options. 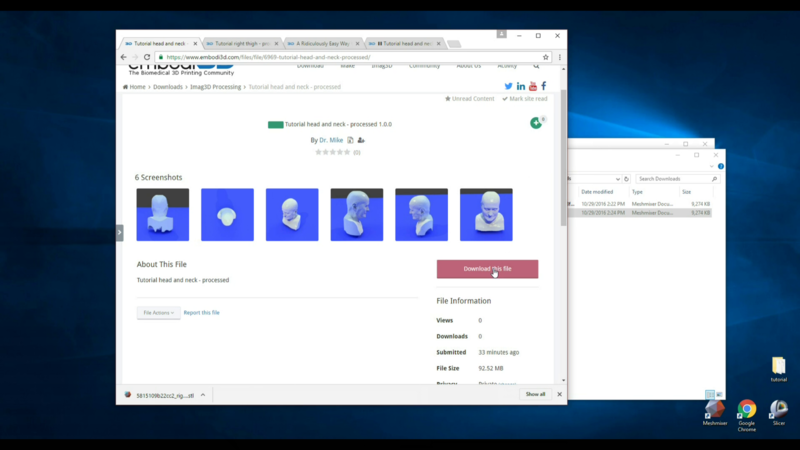 Step 5: Download your new STL file after processing is completed. 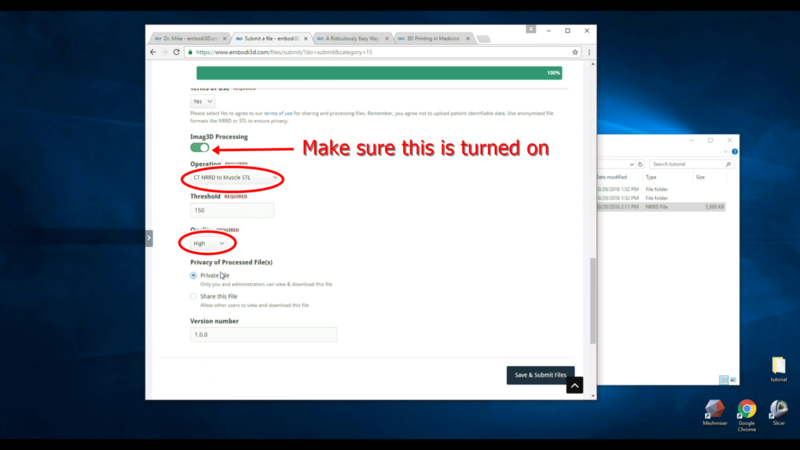 In about 5 to 15 minutes you should receive an email that says your file has finished processing and is ready to download. Follow the link in the email or access the new file via your profile on the embodi3D.com website. Your newly created STL file should have several rendered thumbnails associated with it on its download page. If you want to download the file click on the Download button, as shown in Figure 16. I opened the file in AutoDesk MeshMixer to have another look at it, and it looks terrific, as shown in Figure 17. This file is ready to 3D print! Figure 17: The final 3D printable muscle model. Creating a skin model is essentially identical to creating the muscle model, except instead of choosing the CT NRRD to Muscle STL on the embodi3D.com service, we choose CT NRRD to Skin STL. Launch Slicer. 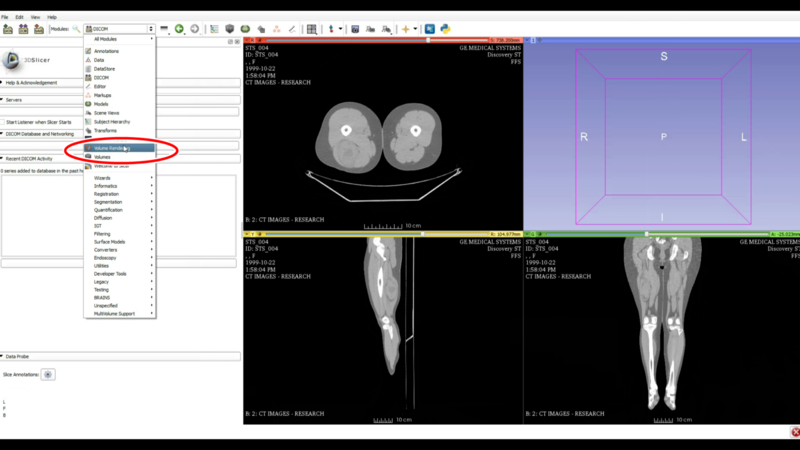 From the tutorial file pack drag and drop the MANIX folder onto the Slicer window to load this head and neck CT scan data set. This is shown in Figure 18. Figure 18: Loading the head and neck CT scan into Slicer. It may take a minute or two to load. From the DICOM browser, click on the ANGIO CT series as shown in Figure 19. In this case we don't need to trim and crop a volume as we did with the muscle file above. We can skip Step 2. Step 3: Save the CT scan in NRRD format. Just as with the muscle file above, save the volume in NRRD format. Click on the save button, make sure that the checkbox for the nrrd file is selected and all other checkboxes are deselected. Specify the correct directory you want the file to be saved in, and click Save. 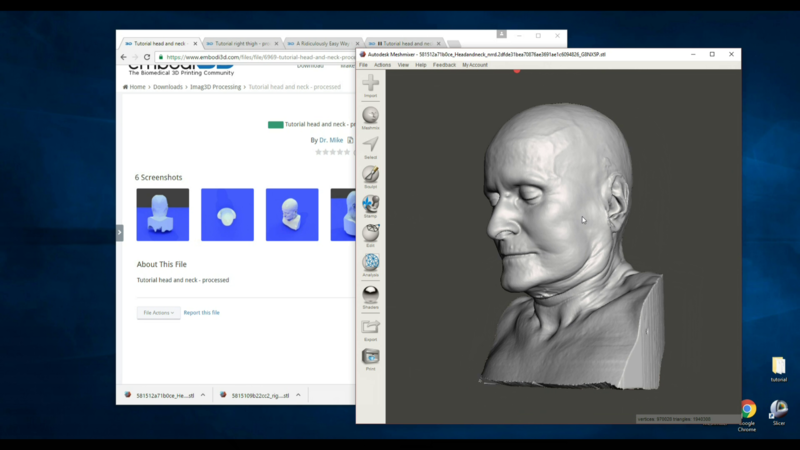 Step 4: Upload your NRRD file of the head to the embodi3D website. 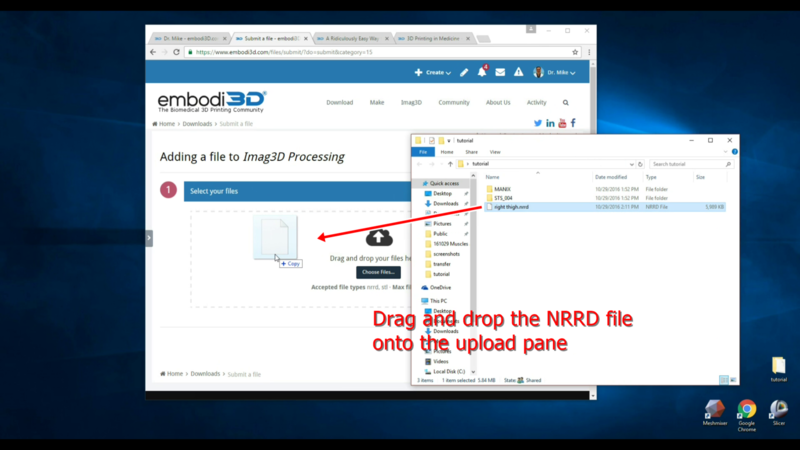 Just as with the muscle file process as shown above, upload the head NRRD file to the embodi3D.com website. Enter in the required fields. In this case, however, under Operation choose the CT NRRD to Skin STL operation, as shown in Figure 20. After about 5 to 15 minutes, you should receive an email that says your file processing has been completed. Follow the link in the email or look for your file in the list the files you own in your profile. You should see that your skin STL file has been completed, with several rendered images, as shown in Figure 21. Go ahead and download your file. 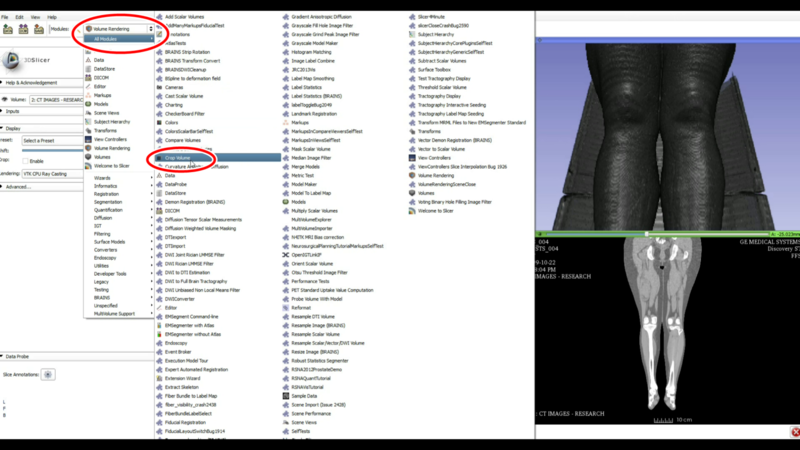 You can then check the quality of your file in Meshmixer as shown in Figure 22. In this instance everything looks great and the file is error free and ready for 3D printing. Figure 21: The download page for your newly created 3D printable skin STL file. Figure 22: Opening the file in Meshmixer for quality control checks. The file is error free and incredibly lifelike. It is ready for 3D printing. Thank you very much! I hope you enjoyed this tutorial. If you use this service to create 3D printable models, please consider sharing your models with the embodi3D community. Here is a detailed tutorial that I wrote on exactly how to do this. This community is built on medical 3D makers helping each other. Please share the models that you create!